1) I cannot seem to go to bed before 2 AM. I was always a night owl growing up (no foreshadowing intended – you’ll understand later), but as a working woman, I had trained myself to consistently go to bed by 10:30 PM and to be at work by 8:30 AM the next morning. This discipline has apparently flown out the window during my sabbatical. I’m slightly disturbed by my lack of a schedule right now. 2) I am having dinner tonight with a guy who was my boyfriend (briefly) in 1994. Enough said. The thing was only about the size of a soda can, even though this photo makes it look bigger. Now folks, I don’t live “out in the country”. I live about 7-8 miles from downtown Nashville…envision pavements and high rise buildings, not rolling hills or wooded areas. 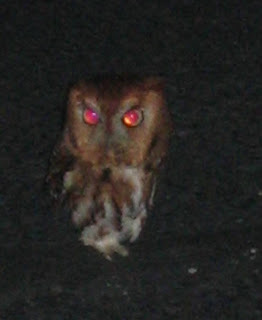 Seriously, a little lost demonic-looking owl in the middle of the parking lot?? I got close enough to take several pictures with a flash and the thing never moved (other than some odd head turn stuff and a few blinks). I’m going with moderately disturbing on this one. I’m going to go with more than slightly disturbing. That thing is evil. Yeah, I’m not a fan of that owl staring at me either. Hmm…in 1994 you were just finishing high school, right? So how did this dinner come about? I hope your dinner with him goes better than my dinner with my high school sweetheart went a few years ago…..
@Ally – he was my first college boyfriend 🙂 But we have kept up a little bit over the years…it was fun catching up again. And it turned out not to be disturbing at all. @Hilary – you know my condo is not far from your office…watch out for the evil baby owl! !